Backyard grill masters and tailgating chefs know the joy that comes from making a delicious grilled meal. However, many may not know that emerging research suggests that there are health risks associated with consuming meats cooked at very high temperatures. But your clients don't have to give up the grill yet. In fact, 75% of adults in the United States own a grill, and the majority (63%) use it year-round because they believe it's a healthful way to cook.1 Healthful grilling is possible using the right foods and techniques to keep food safe. This continuing education course explores the differences between indirect and direct grilling methods, discusses the techniques for cooking a safe and tasty outdoor meal, and examines the research related to disease risk and consumption of grilled meat. It also explores evidence about optimal grilling practices that support health and reduce risks associated with consumption of heterocyclic amines (HCAs) and polycyclic aromatic hydrocarbons (PAHs). There are hundreds of different grill types around the globe and many techniques used to prepare food on them. 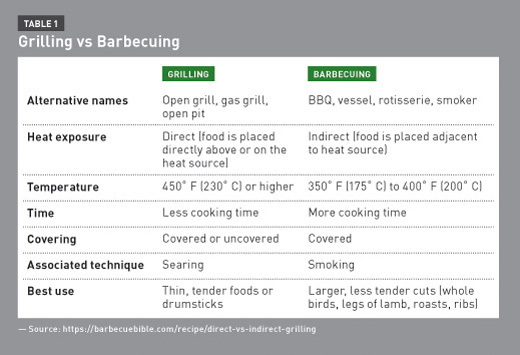 Grills differ by their fuel source: charcoal, wood, and gas (propane).2 Propane gas grills are best used for direct grilling techniques, and charcoal and wood-burning grills are used for indirect grilling (eg, barbecuing and smoking foods), as shown in Table 1.2 This distinction between direct and indirect grilling is based on the heat source. Direct heat grilling involves placement of food directly above or on the heat source (above the flame or on the fire). With indirect cooking methods, the food is placed adjacent to the heat source; for example, if the food is being cooked on a gas grill, the burners below the food are off but the burners to the right and left of the food are on and thus provide the heat for cooking. Techniques also differ according to whether the food is positioned on the grill or over the fire, which enables indirect vs direct cooking. Direct grilling is done on an open (uncovered) grill, such as an open fire pit, and requires high heat. This strategy is best for small, tender cuts that cook quickly, as well as steaks, pork chops, fish fillets, and vegetables. Covered grills, commonly propane gas grills, are the most common type of grill in the United States and allow for both direct and indirect grilling.2 As noted, one can cook indirectly on a gas grill by leaving one burner on and placing the food above the adjacent unlit burner. These grills are versatile but are best for thick cuts of meat, poultry, and fish, as well as whole poultry, roasts, and ribs. Campfire or open pit grills can be used for everything from s'mores to linked meats and whole poultry to skin-on fish. The open pit method provides high-heat roasting that can be completed anywhere from the backyard to the deep woods. The Research: Is Grilling Healthful? Research supports moderate consumption of grilled meat, poultry, and fish that isn't charred and is prepared to a safe temperature.4 Charring is defined as partially burning a food to blacken the surface.5 Proteins become charred by overcooking, use of high heat for an extended period of time, or from a flare-up caused by the drippings of the protein falling directly on the heat source.4 Frequent consumption of charred or well-done grilled meats has been found to increase cancer risk, specifically pancreatic cancer, by up to 60%.6 HCAs and PAHs are the carcinogenic compounds formed when proteins are cooked at high temperatures, charred, burned, or overcooked.6 HCAs are compounds that have at least one heterocyclic ring, and PAHs are hydrophobic compounds that consist of two or more fused aromatic rings.7 An aromatic ring is a conjugated ring structure primarily composed of carbon and hydrogen atoms with a lone pair of electrons. These rings also may include nitrogen and sulfur. Most PAHs are pervasive environmental pollutants, and some are carcinogenic.9 Among the known mechanisms of PAH formation is pyrolysis—the breakdown of organic macronutrients at temperatures greater than 392° F (200° C). PAH formation is greatest at temperatures exceeding 500° F (260° C).7,10 Unstable PAHs are formed by the direct contact of the fat drippings over the flame; these unstable compounds, or reactive structures, have an unequal distribution of electrons that adhere to the food when the smoke rises. Another mechanism for PAH formation is the incomplete combustion of charcoal, leading the PAH to adhere to the surface of the food.11 Charcoal is a fossil fuel, which is composed of carbon and hydrogen. The complete combustion of fossil fuels rearranges the carbon and hydrogen atoms to combine with oxygen (O2) to create carbon dioxide (CO2) and water (H2O). Incomplete combustion leaves some of the carbon behind and produces soot, which manifests as carbon monoxide (CO), a well-known health hazard. It's evident in the literature that HCA and PAH consumption from well-done and charred proteins can increase the risk of cancer.5-11 Risk is greatest with consumption of red and processed meats such as hamburgers and linked or smoked meats (eg, hot dogs, bratwursts, bacon, pulled pork, and pork ribs).5 Therefore, clients should be advised to choose safe grilling practices and consume uncharred proteins prepared at appropriate temperatures to minimize cancer risk. Cooking utensils also merit special consideration;12 this topic will be discussed as well. Safe grilling involves the use of healthful foods and evidence-based techniques. Before educating and counseling clients about healthful grilling techniques, RDs should discuss the quality of individual foods. This is consistent with the recommendation of the American Institute for Cancer Research (AICR) that, while evidence exists that compounds produced during the grilling process may increase cancer risk, what an individual cooks and consumes should be the first priority.5 That said, safe techniques also are important; the following sections will explore grilling methods to ensure safe meals. Meats, which include beef, lamb, and pork, offer a wide variety of grilling and barbecuing options from roasts to ribs and chops to burgers. The AICR recommends limiting beef, pork, and lamb to 18 oz of cooked meat per week and avoiding the aforementioned processed, linked, and smoked meats to reduce cancer risk.5 This includes any beef, pork, or lamb product and processed versions such as ham, bacon, hot dogs, and sausage. To safely cook meat on the grill, time, temperature, and cut of meat are important facets of preparation.2 Time will depend on the size of the cut of meat as well as the cooking method. As noted previously, due to higher temperatures, direct grilling is a faster method than smoking or barbecuing food. If necessary, meat can be cut into smaller pieces to reduce the time necessary to bring it to a safe temperature for consumption.13 Meat also can be precooked on the stove-top (searing) or in the microwave before placing it on the preheated grill to reduce cooking time and release some of the juices within the meat that can cause flare-ups.14 It isn't recommended to precook fish and chicken. While searing locks in flavor and juices in meat, it tends to dry out chicken and fish. Poultry—turkey, chicken, and game birds such as pheasant, duck, and goose—can be grilled, smoked, or barbecued depending on the desired end product. Whole birds tend to be cooked on a rotating spit or rotisserie to allow for even cooking.2 Breasts, legs, and thighs can be prepared on a grill or a barbecue and there is more flexibility in terms of which grill types can be used. The drippings generated from the poultry skin can be a source of flare-ups, which can lead to HCA or PAH formation.6 Skinless poultry is lower in unhealthful fat, specifically saturated fat, and reduces the risk of carcinogenic compounds developing during the cooking process.14 As noted in Table 2, all forms of poultry need to be cooked to an internal temperature of 165° F (74° C) to ensure a safe product.13 Poultry, such as chicken breasts, don't need to rest. They don't maintain enough mass to hold residual heat to permit further cooking. Fish and seafood are lean protein sources for grilling. Firm-flesh finfish are good choices for grilling. These include halibut, cod, sea bass, salmon, red snapper, tilapia, and catfish. Ideally, the fillets and steaks should be at least one-inch thick.14 With thinner fillets, it's best to wrap the fish in aluminum foil to prevent it from sticking and falling between the grates. Wrapping fish in foil also can prevent formation of the aforementioned HCAs and PAHs. Grilled fruits and vegetables produce no HCAs or PAHs when prepared and thus make great foundations for healthful meals.14 In fact, some vegetables that are higher in protein, such as portobello mushrooms, may be suitable substitutions for meat or poultry. Veggie burgers made from peas, beans, and lentils also are good substitutes. Because fruits and vegetables pose few food safety risks, they can be prepared to any internal temperature. These are substitutions for animal-based proteins, as plant-based proteins produce minimal HCAs and PAHs when grilled and cooked. Best bets when grilling vegetables are the previously mentioned portobello mushrooms, veggie burgers, winter and summer squashes, eggplant, sweet bell peppers, onions, and starchy varieties such as corn and potatoes. Popular fruits for grilling include apples, pears, pineapple, peaches, and plums. The natural sugars (fructose and glucose) in fruits and vegetables caramelize in high heat, which enhances their flavor and sweetness.5 There are no risks associated with the charring of produce at high heat because, again, the HCA and PAH production is minimal. Healthful marinades and seasonings can add flavor and color and also reduce HCA levels by as much as 90% in grilled meats and chicken.15 The marinades provide potent antioxidants that block the formation of the harmful HCAs and PAHs. Marination originally was intended to introduce flavor, but the technique also is used to tenderize tougher cuts of meat. Marinades are either acidic or enzymatic. Acidic marinades include ingredients such as vinegar, citrus juices, yogurt, or wine, while enzymatic marinades include food products that contain natural enzymes such as pineapple (bromelain), papaya (papain), or ginger (zingibain). Marinades also contain other flavoring agents such as oil, herbs, and spices. In general, most recipes call for 1/2 cup marinade for every pound of meat, poultry, or seafood.14 To maintain a safe food product, it's important to discard the marinade that was used to soak the uncooked food as it can be a source of contamination unless it's brought to a rolling boil. • Chili powder, derived from chile peppers, is a popular choice for adding heat to a dish. Each teaspoon of chili powder is a fair source of vitamins E, A, K, and B6, as well as copper and iron. The agent within chiles that gives them their kick is called capsaicin, which is also responsible for the anti-inflammatory benefits associated with chili powder. It's also well known that spicy foods can help clear congestion and boost immunity. • Paprika, like chili powder, comes from the Capsicum family of peppers. Unlike chili powder, paprika can be made from a variety of peppers, which contributes to its varying flavor profile. Paprika shares the same micronutrient profiles and health benefits as capsaicin. • Cinnamon is a fragrant brown bark that provides a sweet and warm flavor to desserts and savory dishes. It's loaded with manganese, which is pivotal to both bone health and skin integrity. The active components within cinnamon, including cinnamic aldehyde, cinnamyl acetate, and cinnamyl alcohol, are known for their anticlotting and antimicrobial properties. • Cumin is best known for adding the peppery, smoky flavor to Tex-Mex dishes. It's also a fair source of manganese and iron. Cumin has an age-old reputation for aiding digestion by stimulating the secretion of pancreatic enzymes. • Garlic offers many popular cardiovascular health benefits. Many believe these come only from fresh garlic, but garlic powder and dried garlic cloves retain the potent alliin and allinase; they don't contain allicin. Garlic powder also is protective against a variety of microbes and can boost immunity. Consumers should choose salt-free powders to avoid excess sodium. • Black pepper is a common spice. The active compound in ground pepper stimulates the taste buds and also can signal the stomach to initiate digestion and thus aid in this body process. The heat from black pepper also can have diaphoretic (increase bodily sweating) and diuretic (increase urination) effects. RDs should advise grillers to take caution when cleaning their grills. The Centers for Disease Control and Prevention (CDC) states that many people across the United States present to the emergency department as a result of poor grill-cleaning practices.12 While many of these are pediatric cases, several are individuals who have consumed bristles from grill cleaning brushes. The internal damage caused by ingestion of grill brush bristles varies, from a puncture of the soft tissues within the neck leading to dysphagia and pain upon swallowing to a bowel perforation requiring emergency surgery. Awareness of the severity of these injuries and the associated morbidities is crucial. The CDC cautions the public to take care when cleaning grills because these brush bristles are among the most difficult elements to spot on X-rays and to remove during procedures.12 Therefore, it's best to use utensils that are appropriate for cleaning grills, especially gas and charcoal grills, and to be sure the grill panels are free from debris (food and brush bristles) before cooking. 1. Disconnect propane gas or remove charcoal. 2. Remove the drip pan and discard drippings. 3. Wearing work gloves, remove the grates and soak in hot soapy water. Soak the drip pan, too. Regular dish soap is suggested. 4. While the grates are soaking, cover the heating elements of the gas grill with foil to protect them. Use a grill brush to scrub the inside of the hood or lid. 5. Scrub and wipe down the interior of the grills (hood, lid, walls, etc) with a wet scrub pad, rag, or paper towel. 6. Scrub and rinse grates and the drip pan. 7. Rinse until free from soap and debris. 8. Discard the foil used to cover the heating elements and gently wipe the elements with the grill brush. 9. Replace the interior pieces (metal plates, grates, and drip pan). 10. Reconnect the propane tank or replace charcoal. 11. Clean the exterior of the grill and, if appropriate, the grill cabinet. 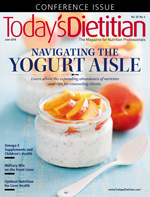 Because dietitians are the food and nutrition experts, knowledge of safe and healthful culinary techniques is essential to a high level of clinical practice. This includes awareness of techniques for grilling and barbecuing as well as strategies to reduce cancer risk such as selecting protein sources low in saturated fats and trimming them to reduce the formation of carcinogenic HCAs and PAHs. Knowledge about safe food preparation practices is also important to an RD's ability to provide patients and the public with information that will prevent foodborne illness. Dietitians can counsel clients about appropriate grilling techniques that can not only minimize cancer risks but also improve the quality of meals. — Cassie Vanderwall, MS, RD, CD, CDE, CPT, is a Madison, Wisconsin-based freelance food and nutrition writer, the manager for the University of Wisconsin (UW) health dietetic internship program, and a clinical nutritionist at UW Health. 1. Compare and contrast grilling techniques to promote quality, safe, and nutritious foods. 2. Discuss health risks associated with consumption of heterocyclic amines and polycyclic aromatic hydrocarbons. 3. 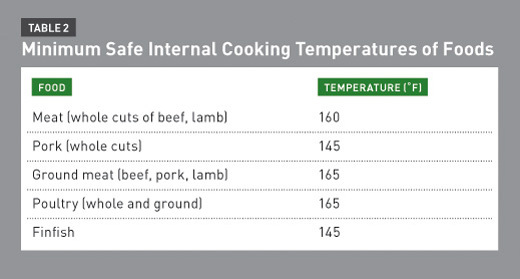 Define safe temperatures for meat, poultry, and fish consumption. 4. Distinguish safe and effective techniques for cleaning a grill. 5. Describe the RD's role in educating patients and consumers about safe, effective, and healthful grilling techniques. 1. Which of the following culinary strategies is most appropriate for large roasts and ribs? 2. What's the primary benefit of using direct grilling techniques vs barbecuing, which uses indirect heat cooking techniques? 3. Which of the following isn't considered processed meat? 4. Which of the following statements accurately describes the best procedures for preparing fish fillets? a. Place thin fish fillets directly on an open gas grill at high heat until internal temperature is 180° F.
b. Place one-inch thick fish fillets directly on barbecue at medium heat until internal temperature is 165° F.
c. Place skewered fish fillets directly on open gas grill at medium heat for 20 minutes. d. Place oiled one-inch thick fish fillets directly on covered grill at medium heat until internal temperature is 145° F.
a. Increases heterocyclic amine (HCA) formation by 200%. b. Increases HCA formation by 100%. c. Decreases HCA formation by as much as 90%. 6. Which of the following determines whether a cooking method is direct or indirect? 7. Which of the following strategies will effectively reduce cancer risk? 8. What's the gold standard method for preparing food that's safe for consumption? 9. Maintaining a clean grill is an effective way to reduce HCA and polycyclic aromatic hydrocarbon (PAH) formation. Which of the following is true for maintaining a clean and safe grill? a. It's best to clean the grill before and after each use. b. It's best to use any wire or bristle brush. c. It's best to give the grill a deep clean once each season. d. It's best to use the heat from cooking to clean the grill. 10. HCA and PAH formation is caused by a reaction in which of the following in grilled food? 1. Olmsted L. The United States of barbecue — America's love affair with backyard cooking. Forbes. April 28, 2016. https://www.forbes.com/sites/larryolmsted/2016/04/28/the-united-states-of-barbecue-americas-love-affair-with-backyard-cooking/#6ab052255a1d. Accessed December, 2017. 2. Raichlen S. Crash course: the 6 major types of grills. Steven Raichlen's Barbecue! Bible website. https://barbecuebible.com/2016/03/18/6-types-grills/. Published March 18, 2016. Accessed May 2017. 3. The chemistry of grilling. American Chemical Society website. https://www.acs.org/content/acs/en/pressroom/reactions/videos/2015/grilling.html. Updated October 8, 2015. Accessed June 2017. 4. US Department of Agriculture, Food Safety and Inspection Service. Barbecue and food safety. https://www.fsis.usda.gov/shared/PDF/Barbecue_Food_Safety.pdf?redirecthttp=true. Updated May 2011. Accessed June 2017. 5. Guide to healthy grilling. American Institute for Cancer Research website. http://www.aicr.org/enews/2014/05-may/enews-guide-to-healthy-grilling.html. Published May 1, 2014. Accessed June 2017. 6. Anderson KE, Sinha R, Kulldorff M, et al. Meat intake and cooking techniques: associations with pancreatic cancer. Mutat Res. 2002;506-507:225-231. 7. Bartle KD. Analysis and occurrence of polycyclic aromatic hydrocarbons in food. In: Creaser CS, Purchase R (eds). Food Contaminants: Sources and Surveillance. Cambridge, England: Wooodhead Publishing Limited; 1991:41-60. 8. Chemicals in meat cooked at high temperatures and cancer risk. National Cancer Institute website. https://www.cancer.gov/about-cancer/causes-prevention/risk/diet/cooked-meats-fact-sheet. Updated October 19, 2015. Accessed June 2017. 9. Jägerstad M, Skog K. Review genotoxicity of heat-processed foods. Mutat Res. 2005;574(1-2):156-172. 10. Knize MG, Salmon CP, Pais P, Felton JS. Food heating and the formation of heterocyclic aromatic amine and polycyclic aromatic hydrocarbon mutagens/carcinogens. In: Jackson LS, Knize MG, Morgan JN (eds). Advances in Experimental Medicine and Biology Volume 459: Impact of Processing on Food Safety. New York: Springer Science+Business Media, LLC; 1999. 11. Wu J, Wong MK, Lee HK, Shi CY, Ong CN. Determination of PAHs in rougan, a traditional Chinese barbecued food, by capillary gas chromatography. Environ Monit Assess. 1997;44(1-3):577-585. 12. Centers for Disease Control and Prevention. Injuries from ingestion of wire bristles from grill-cleaning brushes — Providence, Rhode Island, March 2011–June 2012. MMWR Morb Mortal Wkly Rep. 2012;61(26):490-492. 13. Safe minimum cooking temperatures. Foodsafety.gov website. https://www.foodsafety.gov/keep/charts/mintemp.html. Accessed June 2017. 14. Top ten tips for healthy grilling and barbecuing. American Heart Association website. https://healthyforgood.heart.org/Add-color/Articles/Top-Ten-Tips-for-Healthy-Grilling-and-Barbecuing. Updated February 9, 2017. Accessed June 2017. 15. Melo A, Viegas O, Petisca C, Pinho O, Ferreira IM. Effect of beer/red wine marinades on the formation of heterocyclic aromatic amines in pan-fried beef. J Agric Food Chem. 2008;56(22):10625-10632. 16. The World's Healthiest Foods website. http://www.whfoods.com/foodstoc.php. Accessed October 2017. 17. How to clean a barbeque grill in 15 minutes. DIY Network website. http://www.diynetwork.com/how-to/outdoors/landscaping/how-to-clean-a-barbeque-grill-in-15-minutes. Accessed December 2017.